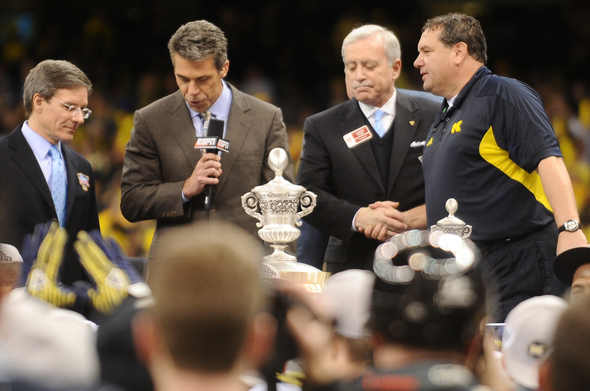 Posted on Wed, Jan 4, 2012 : 4:26 a.m.
Michigan coach Brady Hoke accepted the trophy for the Wolverines' victory in the Sugar Bowl. Three years ago, the Michigan football program suffered its worst season in school history. On Tuesday, that seemed like a distant memory. Sophomore kicker Brendan Gibbons booted a game-winning 37-yard field goal in overtime to give the Wolverines a 23-20 victory against Virginia Tech in the Sugar Bowl. The victory clinched 11 wins for first-year coach Brady Hoke and the second BCS bowl victory in program history. Welcome back to relevancy, Wolverines. • Kyle Meinke column: Michigan football team validates triumphant season with triumphant finale. • Game story: Michigan football team completes turnaround season, tops Virginia Tech in OT. • Game balls:Top honors went to Brendan Gibbons, Junior Hemingway and others. • ESPN.com Video highlights of Michigan's 23-20 overtime Sugar Bowl victory over Virginia Tech. • Our final live chat of the season was a lively one. That transcript can be found here. • Honored at the Sugar Bowl for his recent induction into the College Football Hall of Fame, former Wolverine coach Lloyd Carr offered his thoughts on multiple topics. He also compared Denard Robinson to Anthony Carter. • AnnArbor.com photographer Melanie Maxwell captures the mood, sound and look of New Orleans prior to Tuesday's Sugar Bowl game. • Readers share some of their favorite Michigan football photos before the Sugar Bowl. Wed, Jan 4, 2012 : 9:47 p.m. I agree that a win is a win and that UM shouldn't rest on it's laurels after this game. If you're used to watching bowl games you understand that often times the layoff will hurt a team. I think that was the case for both these teams. Often times Bowl games are decided by special teams which was the case here. Michigan has absolutely NOTHING to be ashamed of. Next year, the Offensive and D lines need to be shored up but I don't think last night's trouble running the ball was as much about the O-Line playing poorly as it was about that crazy 2 back scheme Borges had them playing! It was SO CONGESTED and he wouldn't stray from it. I thought that hurt us. I give credit to VT's D as well. They played inspired ball. I think Kenny Demens played well at Linebacker as well as Jake Ryan. Jake didn't get the credit he deserved for that game. Our corners need experience more than anything. I don't think they're especially small but Countess bit on some double moves that he will hopefully play better next year. Unfortunately, much of the trouble we had with VT is the same type of trouble Big 10 teams have when they play strong, non conference opponents. Our players are a bit slower and not as athletic. Luckily, no Big 10 Team has really solved that problem and we can be competitive. That said, MSU played a great game. They're lucky Georgia's coach is a numbskull because he totally killed his team in the first overtime. Boykin wasn't in on offense AT ALL in overtime AND they chose to kneel on second down and try the FG on THIRD? That was a gift if there ever was one. Not taking anything away from State but I call a spade a spade. Michigan is back to playing ball and I think State will truly feel the wrath beginning next year. Get the kleenex ready! Wed, Jan 4, 2012 : 9:12 p.m.
i think that michigan has made the right choice in head coach! coach hoke showed humility, passing all praises to his team! a far cry from where the wolverines were a year or 2 ago! cheers to all the players, they played tough and took advantage of hokie miscues! i'm so looking forward to next year's michigan wolverines! Wed, Jan 4, 2012 : 10:36 p.m. I wouldn't count on a BCS game next year. Wed, Jan 4, 2012 : 8:36 p.m.
And this concludes yet another truly ugly bowl season for the B1G. They went 4-6 in the bowls. One of the wins was over a middle of the road MAC team; another over a Pac 12 team that ended the season two games under .500. UM was totally outplayed by an ACC team last night but still managed to luck out and win. Hate to say it, but the only decent victory was Sparty's over an SEC team. I love UM, and I think we're headed in the right direction. But the B1G is NOT an elite conference right now and hasn't been for some time. Granted, many of the B1G teams are big and powerful, but they &quot;make up for it&quot; by being slow. Wed, Jan 4, 2012 : 9:57 p.m. Wed, Jan 4, 2012 : 8:31 p.m. Wed, Jan 4, 2012 : 7:44 p.m.
Congratulations to the team members and coaches for an outstanding season. Pride and dignity have been returned to Michigan. Wed, Jan 4, 2012 : 9:56 p.m.
shouldn't be any pride in the Sugar Bowl win though.shouldn't have been there.shouldn't have won. Wed, Jan 4, 2012 : 6:33 p.m. I will take it. Sometimes better to be lucky than good. Thu, Jan 5, 2012 : 2:59 a.m.
&quot;and sometimes you back into things which they did.shouldn't have been thereshouldn't have won.&quot; Tell me again how 3 losses is superior to 2 losses? Fuzzy math. Wed, Jan 4, 2012 : 9:59 p.m.
and sometimes you back into things which they did.shouldn't have been thereshouldn't have won. Wed, Jan 4, 2012 : 4:13 p.m. Envy UM?! LOL. Since when does a big brother envy a little sister? You varmint fans can thank the officials for taking away V Tech's touchdown and handing the game to you on a maize and gold platter. You can hail to this victory with a big fat ASTERISK! Thu, Jan 5, 2012 : 2:55 a.m. The officials were not the reason Junior Hemingway made 2 awesome catches for touchdowns. The officials were not the reason Va Tech made 5 trips into the red zone and only had 1 touchdown to show for it. Blaming the officials is the sound of a whiner. Wed, Jan 4, 2012 : 4:22 p.m. Wed, Jan 4, 2012 : 3:36 p.m.
No amount of comments by armchair pundits will change the fact that the team with the most points at the end of the game gets the win. In a few days, the comments will be buried under mountains of new stuff and forgotten. But the &quot;W&quot; for Michigan is in the record books and will remain forever. Wed, Jan 4, 2012 : 5:36 p.m.
That's certainly true. 2011 goes down as an 11-2 season. No official asterisks. Wed, Jan 4, 2012 : 3:51 p.m.
Well put: In math..If A is greater than B, than B is less the A...Mich 23 Va tech 20. Sugar Bowl trophy comes to Ann Arbor. GO BLUE!!! Wed, Jan 4, 2012 : 3:21 p.m.
Thu, Jan 5, 2012 : 2:52 a.m. Wed, Jan 4, 2012 : 4:41 p.m.
Hey JGC why not go back 50 years when Michigan played the school of Nursing and start bragging how many wins you got. Stop with your History lesson. Right now Michigan is the little Sister and until you beat us your stuck with it. Face it the last 4 years you were served a plate of loser and a side of &quot;Punch in the face&quot; hay, get it #2 punched your dude in the face. Sorry about that MSU plays football with pride and we like to prove it on the field in stead of counting on LUCK! Wed, Jan 4, 2012 : 3:58 p.m.
Hey Little Bro, you seem intelligent. Check out this figure: 67-32-5. I'm sure you know what that is, that's Michigan's all-time record against MSU. Wait a second, that's too far back. Let's go back 20 years, whatcha say? That would make it 12-8 still in favor of your beloved Michigan. Oh wait, that's my beloved Michigan - my bad! &quot;We beat you the last 4 years&quot; I know, I know... It's almost over little bro. Enjoy the ride, because you'll never ever in a million years be on the same level as THE UNIVERSITY OF MICHIGAN. You can try, but you'll never get there. PS - We'd rather be lucky than good. Wed, Jan 4, 2012 : 3:30 p.m. Wed, Jan 4, 2012 : 3 p.m.
Love that fact that the Sparty trolls can't even enjoy their own bowl victory. It warms my heart to know that no matter what they do, no matter what they accomplish, they will never be able to truly enjoy their success for what it is, that they will always compare themselves to the University of Michigan. MSU = always green with envy! Wed, Jan 4, 2012 : 1:41 p.m.
Don't you hate it when the Ref's give you the win not the team. These Refs blew this call twice that resulted into Michigan points. The kicker can not move forward before the snap. This is illegal procedure and a flag should of been thrown TWICE during this game. It has been called before and is a rule, check the rule book. Here is a video where it has been called before. This was not even a close call it was 6 feet away from the head judge. <a href="http://blogs.orlandosentinel.com/sports_college/2010/11/penalty-on-cal-kicker-nullifies-possible-oregon-upset-video.html" rel='nofollow'>http://blogs.orlandosentinel.com/sports_college/2010/11/penalty-on-cal-kicker-nullifies-possible-oregon-upset-video.html</a> Once again Michigan even get's home cooking calls in the Sugar Bowl. Unbelievable. Wed, Jan 4, 2012 : 4:34 p.m. Wed, Jan 4, 2012 : 4:01 p.m.
&quot;Should of been&quot; makes the rest of your point irrelevant. Wed, Jan 4, 2012 : 3:49 p.m. Wed, Jan 4, 2012 : 3:32 p.m.
Yeah Johnny, didn't you just hate it on November 3, 2001? Wed, Jan 4, 2012 : 2:43 p.m. I think what you hate more is having your OT bowl game victory overshadowed by our OT BCS bowl game victory. Wed, Jan 4, 2012 : 2:26 p.m.
By the way, congrats to the second best &quot;three-loss team&quot; in the conference. Wed, Jan 4, 2012 : 2:10 p.m. It goes both ways; howabout the the end of the IA game when we should have had 2 TDs? I can remember one in the ohio game..and that was at home. No, our team won because they happended to outscore Va Tech. Good luck, next season. Wed, Jan 4, 2012 : 2:02 p.m.
VT defensive backs committed several penalties that I saw that did not get called. Wed, Jan 4, 2012 : 1:59 p.m. I'm pretty use the ref's were wearing maize and blue and not black and white. Wed, Jan 4, 2012 : 1:23 p.m.
A win's a win no matter how ugly it is, so congrats to this team, especially the seniors--you deserve it! But that ugly win also has me worried about next season. Per the Detroit News on Twitter, Dave Brandon proclaimed after the game, &quot;I feel very comfortable in telling you that Michigan is back where we need to be and where we want to be.&quot; Maybe you can say that about the defense (save third and long! ), but no way can you say that about the offense. The offensive game plan was brutal and the defense couldn't stop a third (or fourth) and long to save their lives. I'm sure our offense will do fine against the weaker competition, but we pull that same game plan out against Alabama next season and we are going to get hosed. Kudos to David Molk for playing hurt. We are going to miss him greatly next season. I hope Rocko spends all off season practicing snaps to Denard or Jack Miller is ready to fill in. Ditto thanks to Junior Hemingway! He came up with so many big catches this season on Denard's &quot;throw up a prayer&quot; passes to bail him out. Looking forward to the future of Michigan football and the recruits we have coming in, but no way I am going to proclaim we're &quot;where we want to be&quot; after one season and that ugly win. The old saying is &quot;It's better to be lucky than good&quot; and last night we certainly were the more lucky of the two teams. Wed, Jan 4, 2012 : 5:39 p.m.
@MRunner73 -- Molk I knew about. I heard something about Van Bergen. What's the story on Robinson last night? Started the game at less than 100%? Or got dinged during the game? Wed, Jan 4, 2012 : 5:33 p.m. I'm sure what Brandon meant to convey is that Michigan, at this time, is on the improvement path he has envisioned. I doubt he meant to imply Michigan has completely arrived and no further improvement is needed or desired. I have in my head several visions of Brady Hoke from last night -- during the game as well as during the post-game celebrations. There was a look in his eye that suggested to me he was not altogether pleased with the execution during that game. I wish I could be a fly on the wall for a closed-door session between Hoke, Borges and Mattison. Hoke is too good at &quot;coach-speak&quot; to betray his thinking. But my reading is his smile was restrained and he was biting his tongue last night after that game. Don't read into the Surgar Bowl tem performance as a harbinger for 2012. We are finding out now that several palyers were not 100% during the game including not only Molk but Ryan Van Bergen and Denard. Brink and Heininger never got to start. Michigan was in a real hole. In athletics, if your beat your oppenent, it mean they struggled more than you. Va Tech settled for a lot of field goals. The Sugar Bowl trophy will be on display in Schembechler Hall, no matter what. Wed, Jan 4, 2012 : 12:59 p.m. Neither team had top 10 ranking. Over 12,000 empty seats. An incredibly stupid 4th down call by Virginia Tech's head coach. Virginia Tech out gained Michigan, 377-184. Robinson had 13 yards on 13 carries and 9 of 27 passes for 117 yards. Help from the zebras. Very good defense. A successful hail mary. An exciting finish. Michigan won. Go Blue. Another irrelevant B.C.S. game in a very flawed bowl system. Wed, Jan 4, 2012 : 2:12 p.m.
Hope you get chance to stop by Schembechler Hall and check out the Sugar Bowl trophy on display. Wed, Jan 4, 2012 : 1:33 p.m.
shroom, from what I saw VT kept getting help from the zebras, only to have the calls overturned on replay. Flawed system...to the point of meaningless. Wed, Jan 4, 2012 : 12:50 p.m.
Over taxed must be from Ohio state. Go blue. You deserve to be called winners! Wed, Jan 4, 2012 : 12:14 p.m. Thank you, Hemingway!!!!! You have been great this season.